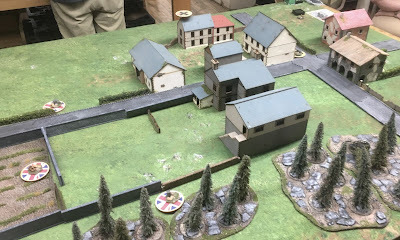 Yesterday myself and Mike got in our 6th game in the Martlet campaign at the Hobby Bunker in Malden. 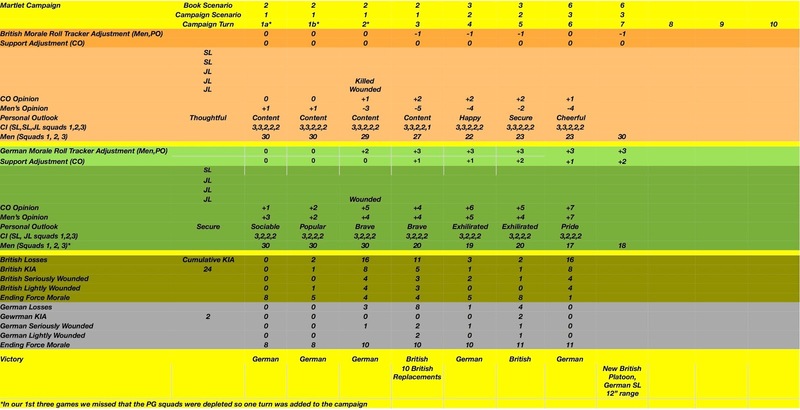 The British have had a hard time of it in this campaign and have only won 2 games and yesterday was no different. 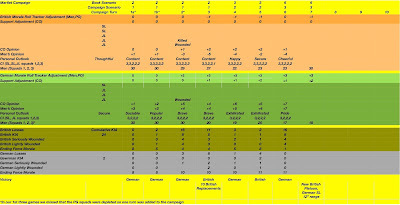 This is scenario 3 from the campaign booklet and scenario 6 from the rulebook. 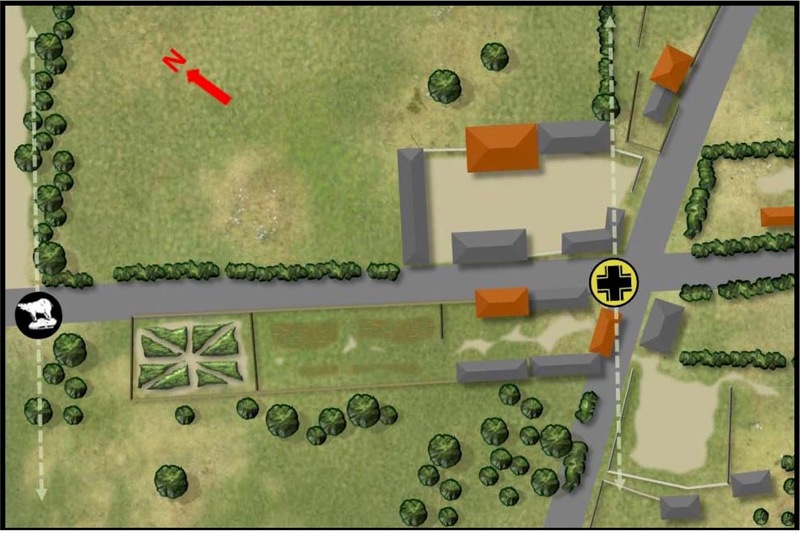 Essentially the British had to take the crossroads forcing the Germans to withdraw. 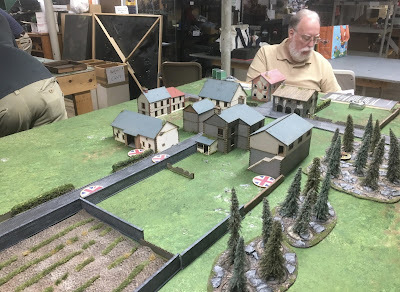 They had a big advantage in support with 20 points vs 7 for the Germans. The game started well enough for the British with 4 free moves in the Patrol Phase with excellent positioning of their JOP's as well as getting a section in the closest house on the British right flank as well as a Bren team with a JL behind the wall. A 2" mortar was able to start laying smoke. Unfortunately on the German first phase they were able to call up the off table mortar and as they had a double 6 on their CR a barrage was laid on top of the 3 British teams. Within a couple of phases their morale had gone from 9 to 5. 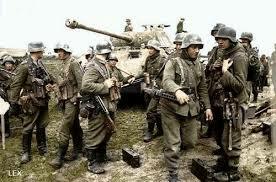 The Germans occupied the centre building on their right flank and placed their Panzer IV on the centre road. This went on for a while and a paucity of 5's on the British CR's forced them to wait for a 3d6 to appear on a CR to end the turn. 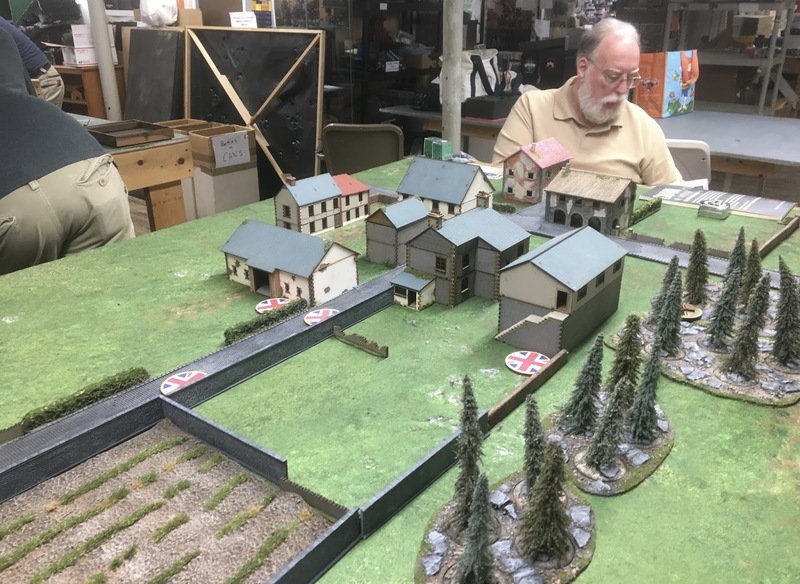 They were able to advance a team just outside the barrage area on their right flank and the Churchill AVRE advanced with another infantry section on their left flank. 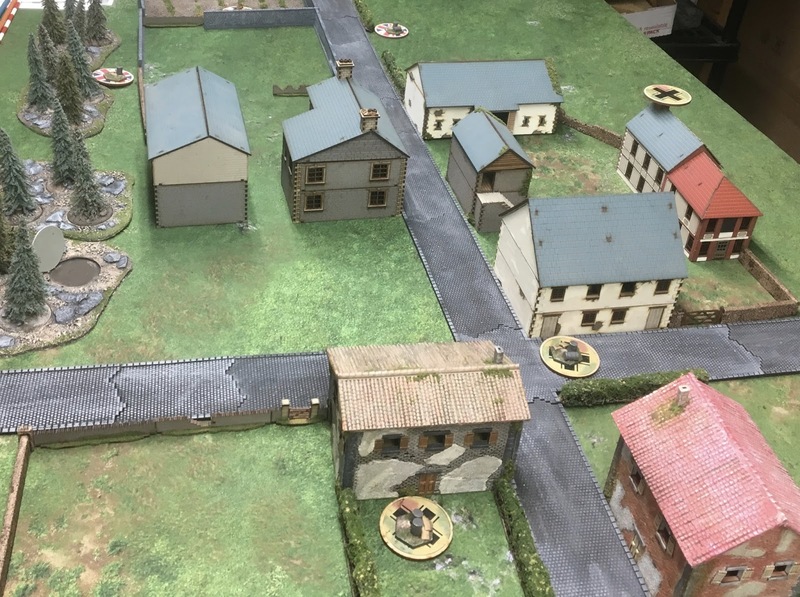 The turn finally ended and the barrage was lifted, the British made an attempt to advance on their extreme right flank, this was countered by the Germans by placing a PG squad on their left flank just behind the closest building. The Germans were then able to restart the mortar and again caught 3 British teams with the barrage area. 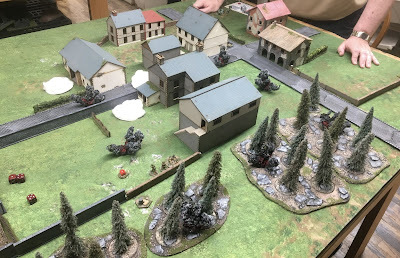 The Germans had incredible dicing in both barrages with at least 2-3 hits on every throw. This was countered by the British with 5 and 6's on their save rolls resulting in several more morale tests and the now they were down to 3. It was clear that the British would not overcome the Hitler Jugend's "line of resistance". The only thing I could hope to do was cause significant attrition on the PG's. 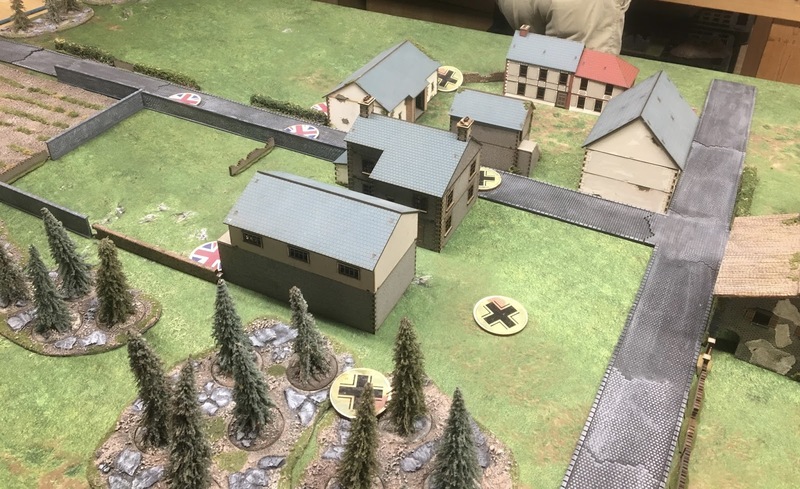 The only Chain of Command dice I had obtained was used to interrupt the German's next phase with the Churchill AVRE firing it's mortar at a stone house where a squad of PG's were encamped...........16d6 fired resulted in a total of 3 shock.................it just was not to be my day. SL range extended to 12"
Nice set up. A shame about the lack of success for the British. Here's to better luck next time. thanks AJ, we will have to see. Great AAR. What do you think of the rules? Currently I'm trying to convince my group to give C.O.D a chance. Great table. I can highly recommend CoC, it is a great game especially in campaign mode as above. Only 3 shock on that AVRE shot??? Yikes...tough outing.